This will be our second circuit. Before we start, let us talk about PWM. 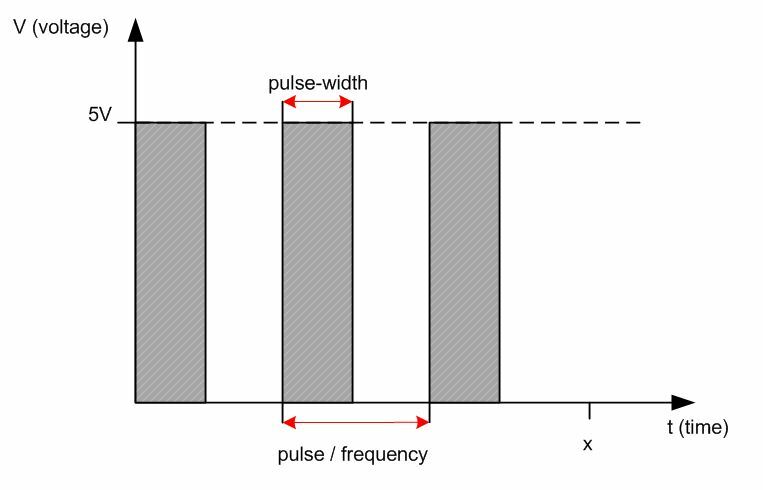 PWM is the abbreviation for pulse-width modulation. What is it? We use the same (fix) frequency, we change the pulse width only. Pulse A is longer, pulse B is shorter. Take a closer look at pulse A: We use 50% of the time with energy, 50% time without. Pulse B use 25% of the time with energy, 75% without. Our LED get more energy with pulse A, it shining brighter. If we use pulse B, the LED gets less energy, it’s appears darker. Some words about pulse-width Modulation and Arduino Uno. 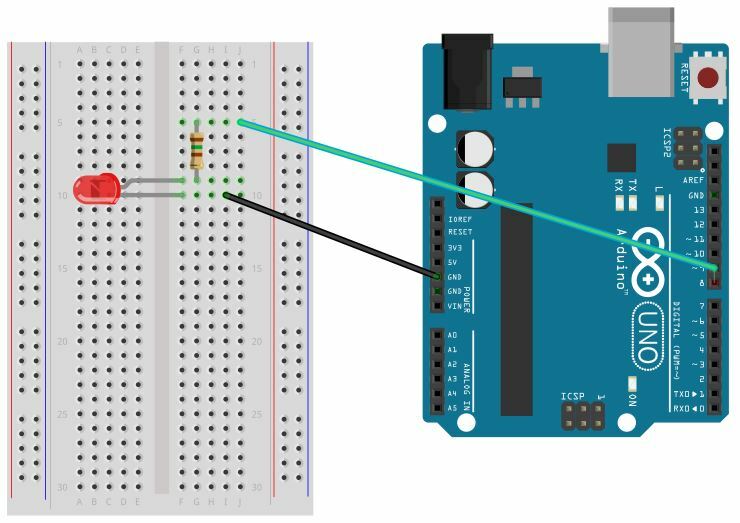 The Arduino Uno has 6 pins which can be use with pulse-width modulation. If possible, don’t use pin 5 and 6. This pins are shared one timer together with the millis() and delay() functions. And so it’s possible sometimes, that an LED isn’t powered off with pulse-width 0. Each pin has an 8 bit output. You can use values between 0 and 255. The Arduino function analogWrite() delivers a rectangle wave Signal with a pulse-width comparable to the value passed. The PWM frequency is fix. It is round about 490 heart (Hz). Control an LED with pulse-width Modulation (fade an LED)! You see, it’s the same construction like tutorial 1.0 LED – the first sketch! Let’s start our Arduino software to create the sketch. 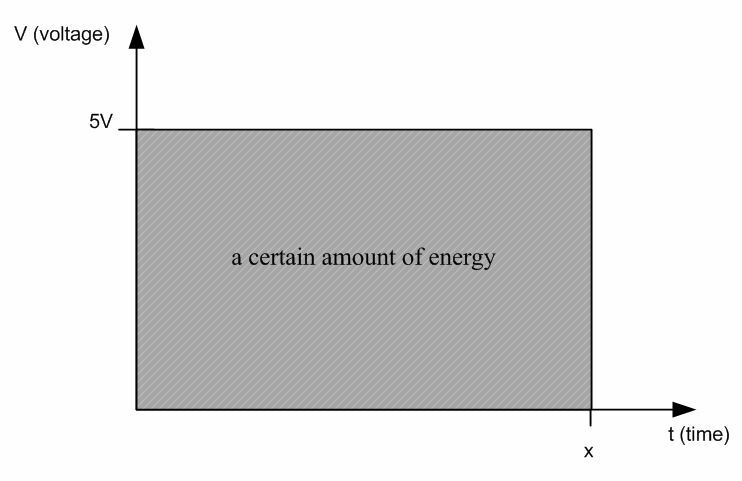 The first 4 lines (/* … */) declare a comment. We define a variable with the name “pinled“. The type is integer, and we assign the value 9. You remember, we use Pin 9 to communicate with the Arduino. Commands in this block will perform on start (or reset) of our sketch. Once only. We define the direction – we want to use Pin 8 as an output Pin. Commands in this block will perform endless. We send a “HIGH” to Pin 9. This means, Pin 9 has 5V in this moment. Current flows, and we see the LED is on! We modulate the pulse-width! We can use values between 0 and 255. The value 100 means, the LED is significantly darker. After this statement, we wait 1 second to register the dark LED. We send a “LOW” to Pin 9. The LED is powered off. We wait one second to “see” that the LED is off. Now, we use a “For-loop” to manipulate the brightness of the LED. We define a variable i. The first value is 0. In each pass we increase i by one. The maximum is 255, not more! In the loop we send i to pin 9 and wait a little bit to see the change of brightness. With the maximum of 255, the LED is on (like digitalWrite(pinled, HIGH). The second loop is similar. We change the direction only. We start with a value of 255 and decrease the value in each pass. The last statement here is analogWrite(pinled,0) – the LED is off (like digitalWrite(pinled, LOW). Thats all! You can play with the delay times or with the increment of “i” … that’s your part. "16x2 LCD display" 4x4x4 7-segment display 74HC164 74LS47N 240x320 3461BS 7805 arduino arduino 3461BS arduino uno atmega168 atmega328 cascade clock dagu DS18B20 flask HC-SR04 ilc 1-1/8 iv-11 iv-18 iv-25 ivlm1-1/7 kingbright led cube Level converter LM7805 measurement Multiplexing new project obstacle detection python qvga display raspberry pi robot platform rover rover 5 servo SPI TFT the little on the little one tubes tutorial water drops WS2812 RGB5050 "LED stripe"